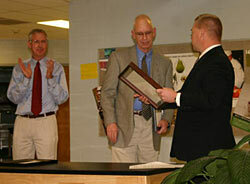 CAPTION: Dave Goodwin (center), accepts the 2008 Teacher of the Year Award from Chillicothe R-2 assistant superintendent Wade Schroeder (right) with Chillicothe Education Foundation president Ed Douglas (left), and the large crowd in attendance, giving a standing ovation. Goodwin, a 4th through 12-grade instrumental instructor, received $1,500 cash and $1,000 for educational expenses from the Chillicothe Education Foundation. Several Chillicothe R-2 School employees and teachers were honored Monday during the 17th annual Teacher of the Year program held in the Chillicothe High School commons area. District Superintendent Dr. Linda Gray Smith served as master of ceremonies and aided by R-2 assistant superintendent Wade Schroeder. 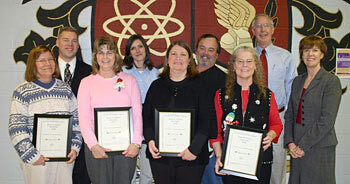 The two honored several district employees for their years of service. However, the highlight of he event occurred at the end of the program with the announcements of the second-annual Beacon Award and the 2008 Teacher of the Year Award. Respectively, those two awards went to Ron Rader, Field School custodian; and Dave Goodwin, fourth through twelfth grade instrumental music instructor. CAPTION: Field School custodian Ron Rader (second from left) was named the 2008 Beacon Award recipient Monday during the Chillicothe R-2 School District's annual awards ceremony at Chillicothe High School. Pictured with Rader are Wade Schroeder (left), R-@ assistant superintendent; R-2 superintendent Dr. Linda Gray Smith (third from left); and Ed Douglas (right), Chillicothe Education Foundation President. Ed Douglas, Chillicothe Education Foundation president, made a few brief remarks and distributed awards totaling a combined $800 to Rader and the other staff members nominated for the Beacon Award. He also presented awards totaling $10,000 to Goodwin and the other teachers nominated for the Teacher of the Year Award. Douglas also explained that the foundation implements the Beacon Award (to non-certified staff) and Teacher of the Year Award program as a way to encourage excellence in education. The foundation, he said, also encourages excellence through its Mini Grant program and the administration of several scholarships. Douglas also mentioned those serving on the Chillicothe Education Foundation board: Brenda Fellhoelter, Julie McCoy, Lindy Chapman, Inger Young, Mary Staton, Bruce Brodmerkle, Ed Milbank, Mike Turner, Ed Douglas, Dr. Linda Gray Smith and Wade Schroeder. In presenting the Beacon Award, Schroeder said the six individuals who were nominated were being recognized because of their dedication to their position, their profession and to the children and staff of the district. Those nominated also included Marlene Paulus, ECSE para-professional from Garrison School; Marcella Murray, library clerk at Dewey School, Susan Rogotzke, library aide at Central School, Peggy Bacon, para-professional at Chillicothe High School and Anita Coult, basic skills aide at the Grand River Technical School. CAPTION: Several non-certified staff members were honored for their dedication to their profession and the students of the Chillicothe R-2 School District on Monday in the Chillicothe High School commons area. Non-certified staff members nominated for the Beacon Award and the recipient are, front row, from left: Marlene Paulus, Garrison School ECSE para-professional; Marcella Murray, Dewey School library clerk; Anita Coult, Grand River Technical School basic skills aide; Peggy Bacon, Chillicothe High School para-professional; Dr. Linda Gray Smith, R-2 superintendent. Back row, from left: Wade Schroeder, R-2 assistant superintendent; Susan Rogotzke, Central School library aide; Ron Rader, Field School custodian, Beacon Award recipient; and Ed Douglas, president of the Chillicothe Education Foundation. As the recipient of the award, Rader received $300 and all those nominated for the award received $100 from the foundation. As the 2008 Beacon Award winner, Rader received $300 and each nominee received $100 from the Chillicothe Education Foundation. In introducing Rader as one of the nominees for the award, Schroeder noted that the custodian has worked in the R-2 district for 24 years. "He is a self starter. He sees what needs done and jumps in to do it without being asked. 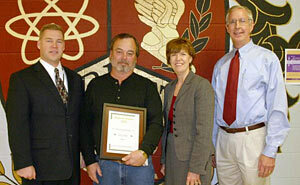 Ron is a team player always willing to help others," Schroeder said, reading comments written about the custodian. He added that Rader takes on a variety of tasks through his job, from assisting in the cafeteria to fixing broken items. "Ron is willing to lend a hand. He is a friend to the children even as he works to instill good behavior and citizenship from them," Schroeder read. He added that Field School students know Rader is a man they can trust and often seek him out for help and advice. "Ron has a great heart and a willing hand. He gives of himself freely," Schroeder concluded. The assistant superintendent also told those gathered that all those nominated and, indeed, all non-certified staff within the district are an important part of the R-2 team, and a reason why the district is successful in its mission to educating its students. Prior to introducing the 2008 Teacher of the Year Award nominees, Smith said she appreciates the efforts of the nominees in completing the comprehensive packet of Teacher of the Year questions. She said that in reading the submitted information, she was able to get a glimpse of why those teachers decided to teach and, among other things, what they want others to know about education. Each Teacher of the Year nominee receives $500 cash and $1,000 for educational supplies, equipment or professional development. As the 2008 Teacher of the Year, Goodwin receives $1,500 cash and $1,000 for educational expenses from the Chillicothe Education Foundation. 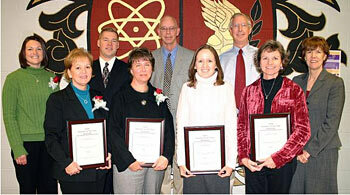 CAPTION: The nominees and recipient of the 2008 Teacher of the Year Award are, front row, from left: Pamela Hostetter, Field School second grade teacher; Emily O'Dell, Central School fourth grade teacher; Tara O'Dell, seventh and eighth grade language arts teacher at the Chillicothe Middle School; and Jenny Hughes, business instructor at the Grand River Technical School. Back row, from left: Keri Rodenberg, kindergarten and first grade special education teacher at Dewey School; Wade Schroeder, R-2 assistant superintendent; Dave Goodwin, fourth through twelfth grade instrumental instructor, Teacher of the Year Award recipient; Ed Douglas, Chillicothe Education Foundation president; and Dr. Linda Gray Smith, R-2 superintendent. Goodwin was one of the six teachers nominated for the Teacher of the Year Award. Others up for the honor were: Keri Rodenberg, kindergarten and first grade special education teacher at Dewey School, Pamela Hostetter, second grade teacher at Field School, Emily O'Dell, fourth grade teacher at Central School, Tara O'Dell, seventh and eighth grade language arts teacher at the Chillicothe Middle School, and Jenny Hughes, business teacher at the Grand River Technical School. Schroeder also distributed pins to R-2 teachers and staff members for their years of service to the district. Linda Fox, Betty Sue Radcliff and Judy Leach (who was not present) were honored for their 30 years of service. Awards for 25, 20, 15, 10, and 5 years of service were also awarded.